Never before on the market. 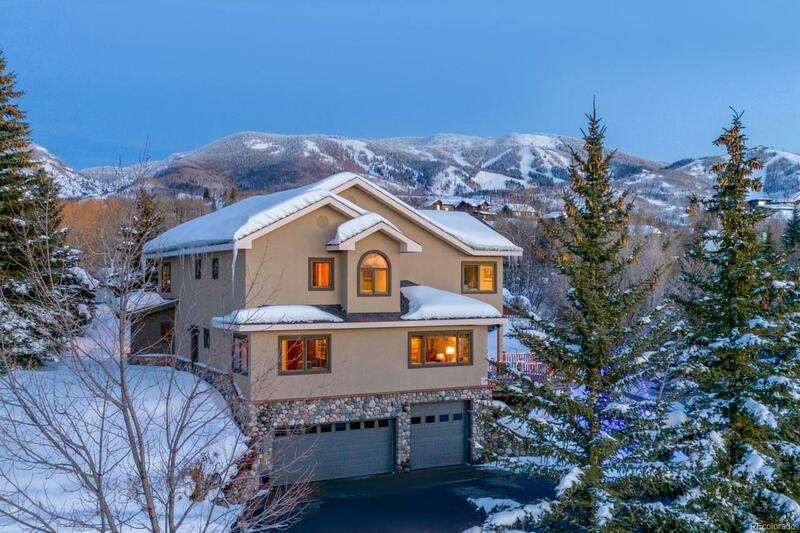 Custom designed and built by local, quality construction professionals, this ideal 4 bedroom Mountain View Estates home is situated on a spacious lot with mature landscaping, pine and aspen trees, and with views spanning from the ski mtn to snowcapped Flattops. The king of all garages (approx 1267 sq ft, 4+ cars). Keep all the vehicles, toys and hobbies too, in a warm heated space. Just a short drive both to downtown Steamboat, hiking trails, schools, and the ski area. Entertain in a beautifully updated kitchen with granite countertops, stainless appliances, & ski area views, cozy hearth room with stone fireplace, and main level bedroom/office. The upper levelâs spacious master suite captures views of the slopes and has a master bath with separate vanities, bright natural light and expansive his & her closets. Guest bedrooms each offer ensuite baths. Heated sidewalks (no shoveling! ), private backyard patio and beautiful usable lawn.